Authored by furkantokac on May 16 2018, 10:43 PM. 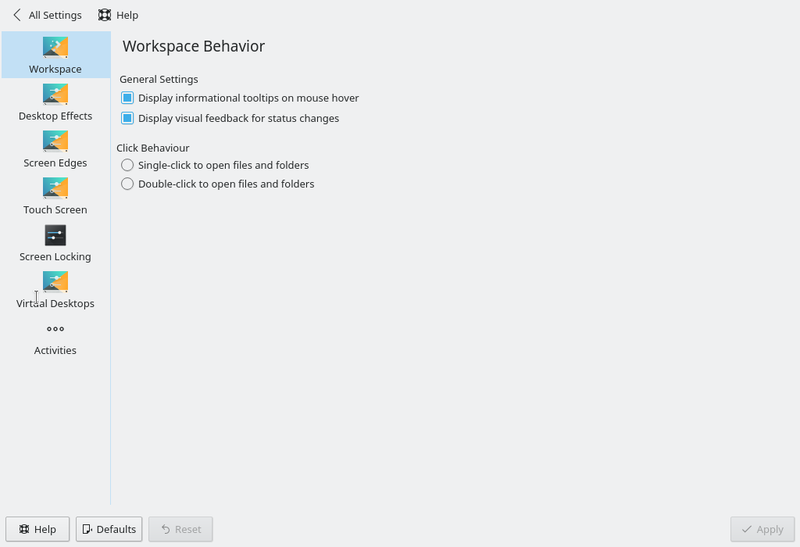 This patch renews the System Settings -> Desktop Behaviour -> Workspace. but now, it is kcm_workspace like other renewed KCMs' names. are tested. "Default", "Reset" buttons works like a charm. furkantokac edited projects, added Plasma: KCM Redesign; removed Plasma. Can you change the title to something more specific. is this copy pasted from somewhere? why is here a column inside a columnlayout? Is this file actually used at all? Oh I know it but just forgot. Editing. Thanks. There will be other options so that time it will make more sense I think (see the ss). Maybe we can change it to "General Workspace Settings". If you have any suggestion, you're welcome. Got it :) I fixed "Default" button and some important things and applied the suggestions. Update is coming. This is unnecessary. Just ignore it. ExclGroupBox.qml and ToolTip.qml are not used now but they'll be used. I forgot to remove them. Yeap it's Roman's implementation used in "input" kcm. Shouldn't I use it ? Actually it is used. It has "units" in it. Items under the "Column" has smallSpacing. Items under the "ColumnLayout" has largeSpacing. Otherwise, it looks bad. Can you explain why ? Just want to learn. Also, this patch doesn't actually solve https://bugs.kde.org/show_bug.cgi?id=393547; it just ports the KCM to QML in preparation for fixing it. So please remove the BUG 393547 keyword and let's only add it to the patch that actually re-adds the missing feature. Those are special hints which are used only by plasma applets. This isn't a plasma applet. So they do nothing. If this code is used in multiple KCMs, we shouldn't duplicate it; we should upstream it so that it only needs to exist in one place at a time. Why are these within braces? like this. Did I miss a point ? Makes more sense :) Done. It can be reused. I'll delete it now (new patch is coming) then we can talk about it for the other patch. I believe you should remove all Name[...]=... and only leave the Name=Workspace line. Same for Comment. This stuff is added by the translation team. furkantokac marked 16 inline comments as done. Bracked style correction. Removed translation data in ".desktop" files. Please don't rename workspaceoptions.h and workspaceoptions.cpp to kcm.h and kcm.cpp in this patch to preserve the git history better. But imo you can remove Marco's copyright from these files, because you basically rewrote the files from scratch. kcm.cpp and kcm.h files are renamed as workspaceoptions.cpp and workspaceoptions.h to preserve the git history better. Bug fixed about checkbox check states. Coding style nitpick: No whitespace after ( and before ). Also, I believe, there should be a whitespace between control statement keyword and opening parentheses. That will not work. The name of the translation catalog is "kcm_workspaceoptions" (see below). This might not work with translations as the translation catalog is named "kcm_workspaceoptions". Iirc that's unrelated. The catalog name is not set by this call. So do we need to change this here, in the CMake file, or can the translation catalog be renamed (or a new one created) with the name kcm_workspace to make the naming consistent? Before in this KCM we used kcm_workspaceoptions, workspaceoptions and kcmworkspaceoptions at different places. I want to use kcm_workspace only now everywhere. Either you keep the old name, or you change it to kcm5_<name> (which may help avoiding headaches in future). The values in TRANSLATION_DOMAIN and Messages.sh should be consistent. Change this line as follows? Either the old name, or kcm5_<foo>, and it should be the same as TRANSLATION_DOMAIN. Ok, I will upload a diff shortly in order to change it here and in the TANSLATION_DOMAIN to kcm5_workspace. I was just a bit unsure about the 5 in the name, because other QML rewrites of KCMs I saw didn't have it in their TRANSLATION_DOMAIN/Messages.sh. But in most cases the renamed KCMs kept the old name, and that's fine too. Jeez, I won't say who these people were (Night Color KCM...). Ok, I created a patch in D12956. Pls quickly ack. Done. Thanks. I avoid small changes for better diff revision so now I'm reviewing the whole patch. ToolTip is done but the loading has problem. 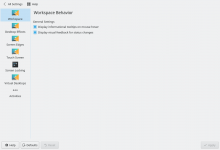 kcm_workspaceoptions changed as kcm_workspace. Test is done. Conflict is solved. 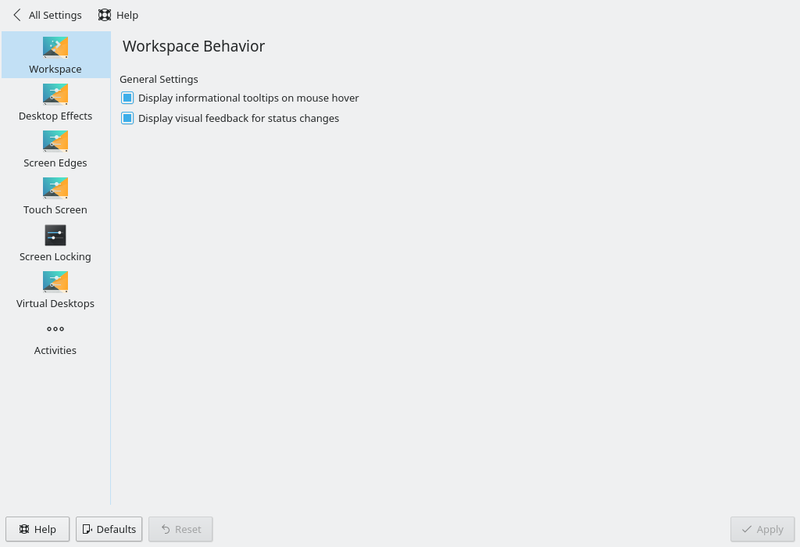 kcm_workspaceoptions is working but not finished.